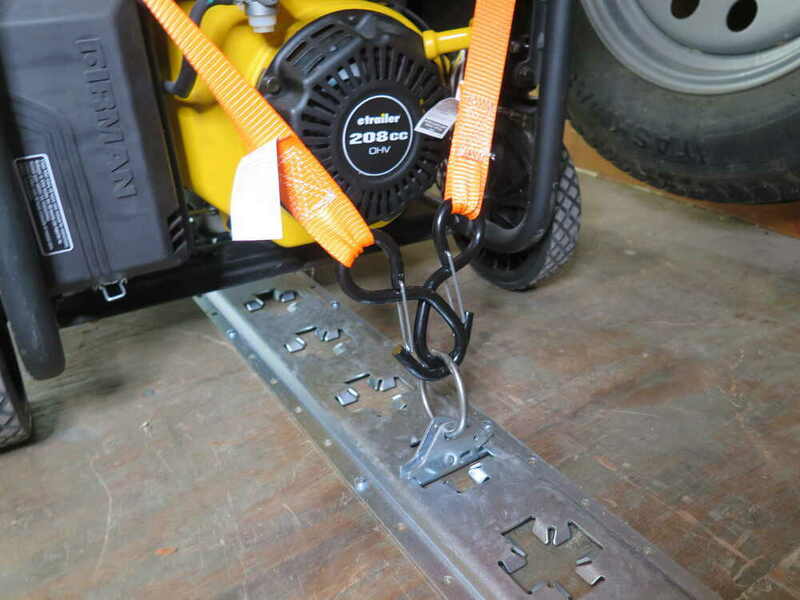 Securing your cargo is easy with these ratcheting tie-down straps. 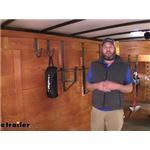 S-hooks with wire keepers make it simple for 1 person to secure each strap in place. A durable storage bag is included for when the straps aren't in use. 2,500 lbs Max load. 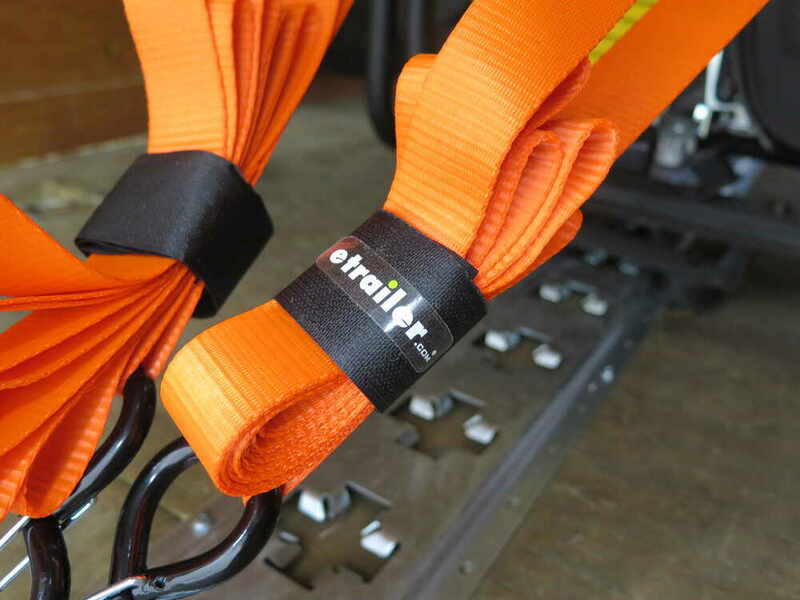 Lowest Prices for the best ratchet straps from etrailer. 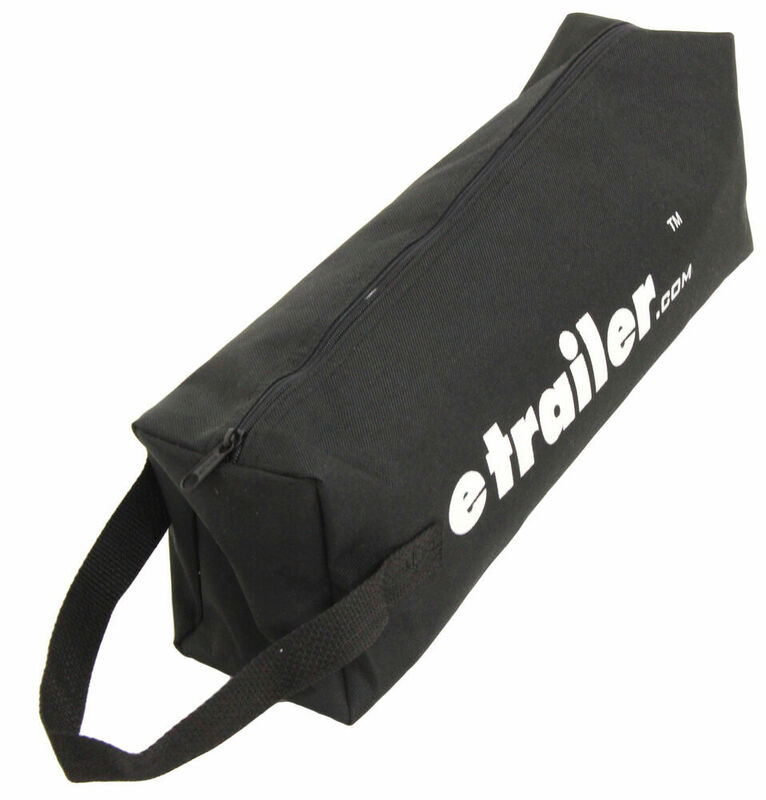 Ratchet Tie Down Straps w/ Storage Bag - 12' Long x 1-1/4" Wide - 830 lbs - Qty 4 part number ETBMB-05852 can be ordered online at etrailer.com or call 800-298-8924 for expert service. 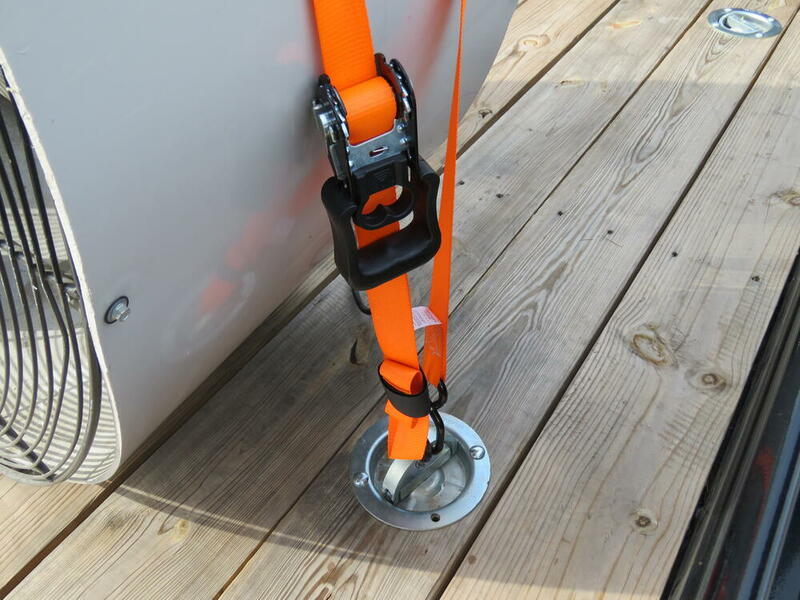 Securing your cargo is easy with these ratcheting tie-down straps. S-hooks with wire keepers make it simple for 1 person to secure each strap in place. A durable storage bag is included for when the straps aren't in use. 2,500 lbs Max load. 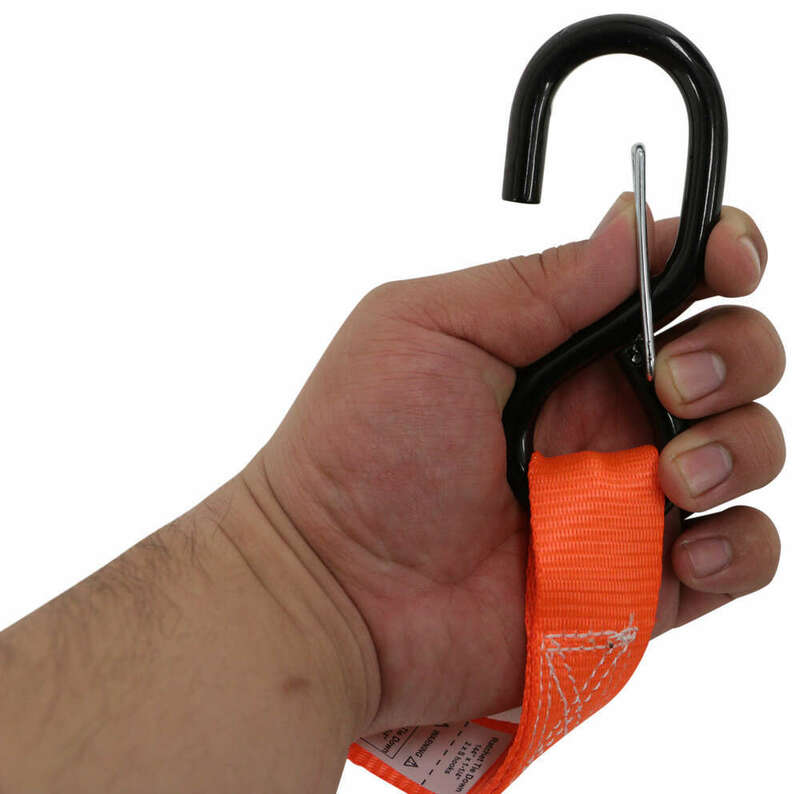 Securing your cargo is easy with these ratcheting tie-down straps. 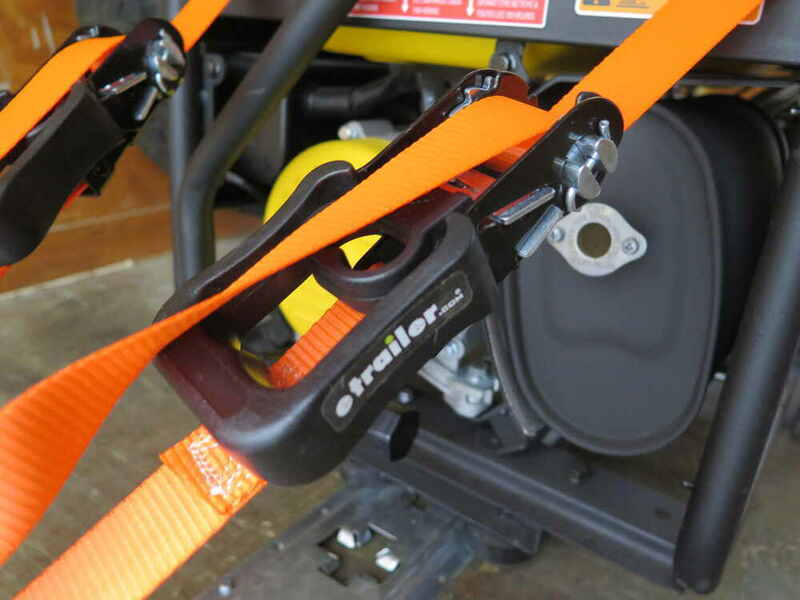 Extra-wide handles make it easy to ratchet the straps to tighten them down and maintain tension. Quick-release buttons on the ratchets allow you to quickly and easily release the tension on the straps for unloading. Each strap has 1 solid S-hook on one end and 1 S-hook with a built-in wire keeper on the other end. 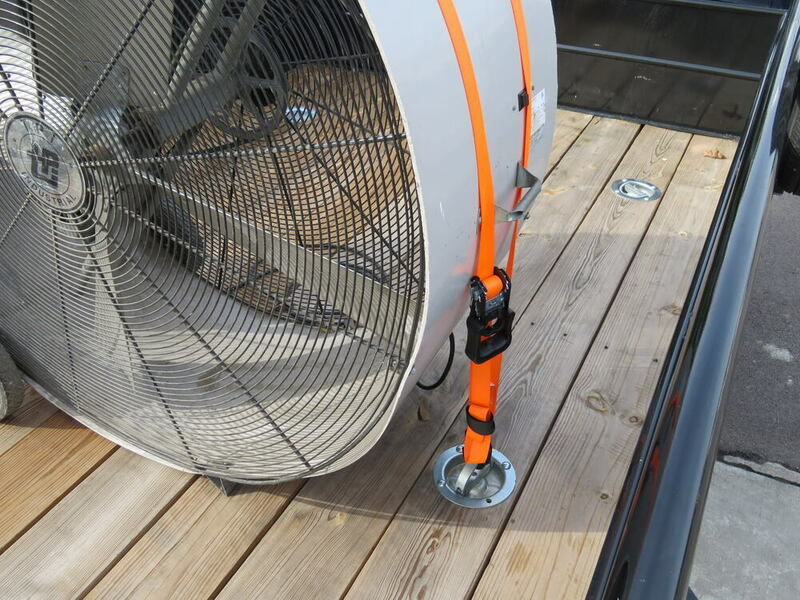 This wire keeper keeps the hook from accidentally disconnecting so that 1 person can safely and easily secure each strap in place. Hook and loop straps secure any excess webbing in place to keep it from flapping around while you drive. 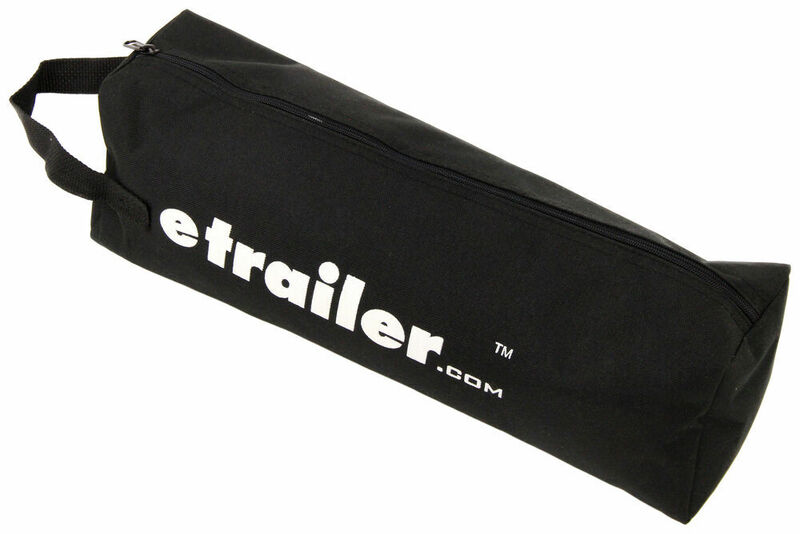 The included bag from etrailer.com lets you conveniently store the tie-downs when they're not in use. Built with durable nylon, this bag has a large zipper opening that runs the full length of the bag, allowing you to easily insert and remove items. It also includes a no-hassle zipper closure, making it very easy to open and close. The reinforced handle lets you transport items with ease. 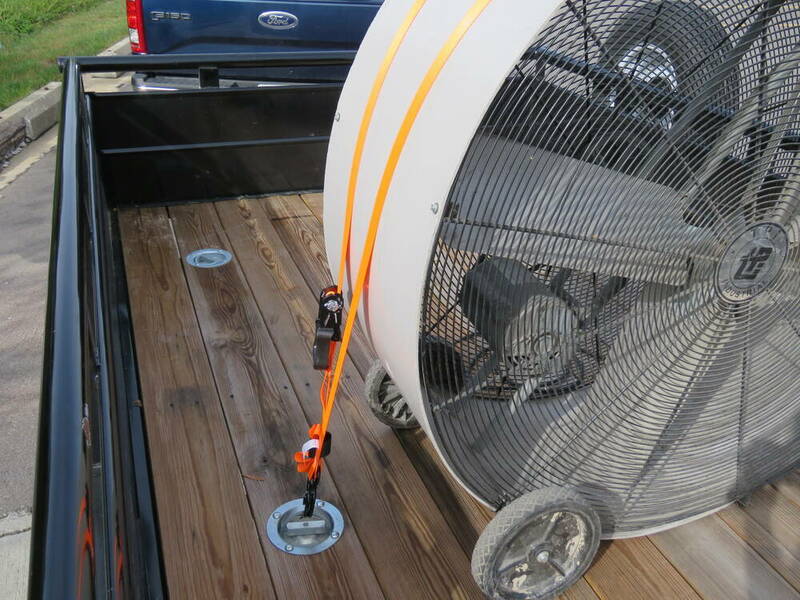 These tie-down straps let you secure gear to your truck bed, trailer, or cargo carrier. 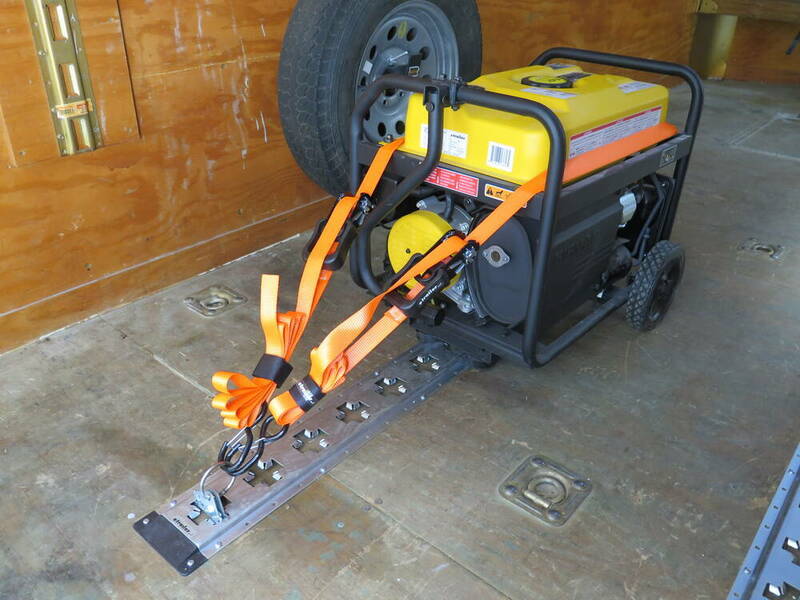 Ratchet mechanisms make it easy to tighten the straps down over your load. 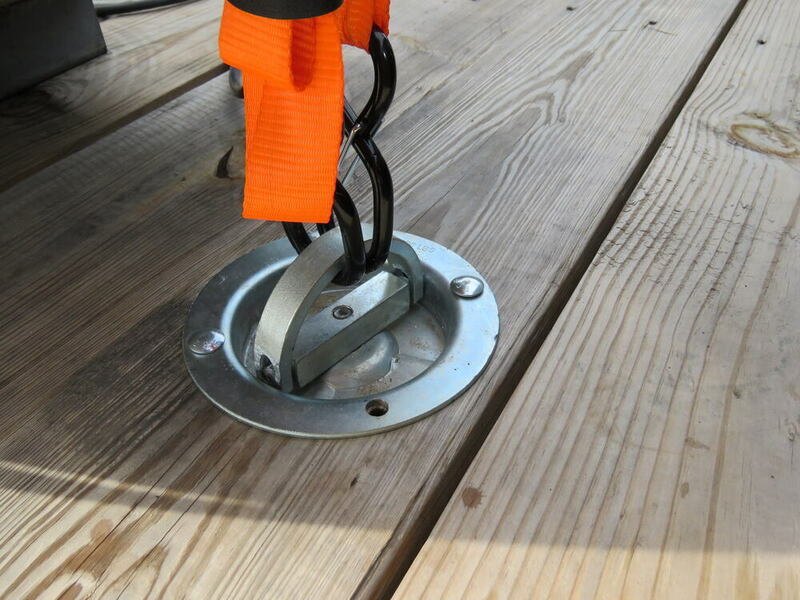 And the sturdy S-hooks connect to anchor points. 1,500 lbs Max load. Durable tie-down straps pair quick-release action with a retractable design for easy loading and unloading. Any unused strap automatically retracts into the housing, and you can quickly release each strap by pushing a button. 1,200 lbs Max load. 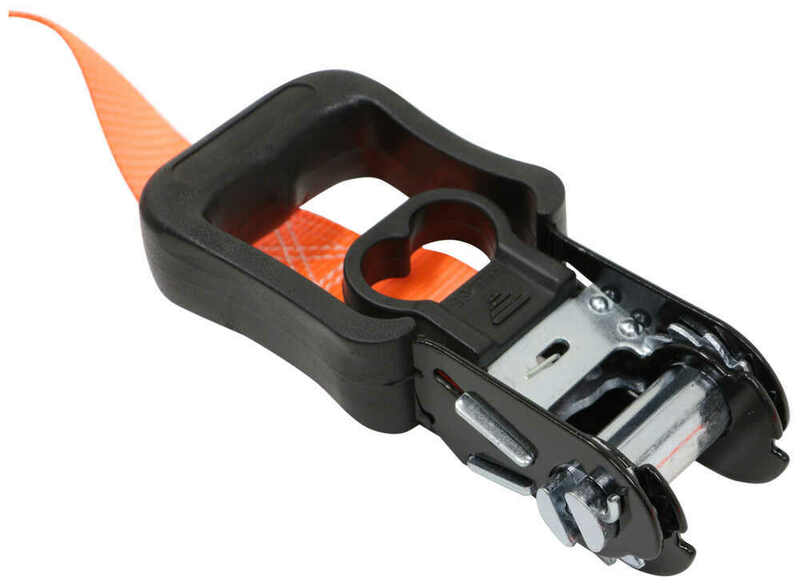 Heavy-duty tie-down straps pair quick-release action with a retractable design for easy loading and unloading. Any unused strap automatically retracts into the housing, and you can quickly release each strap by pushing a button. 3,300 lbs Max load. 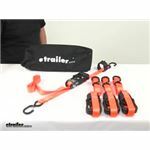 Speaker 1: Today we're taking a look at the etrailer ratchet tie-down strap kit, comes with four ratchet straps and a storage bag. 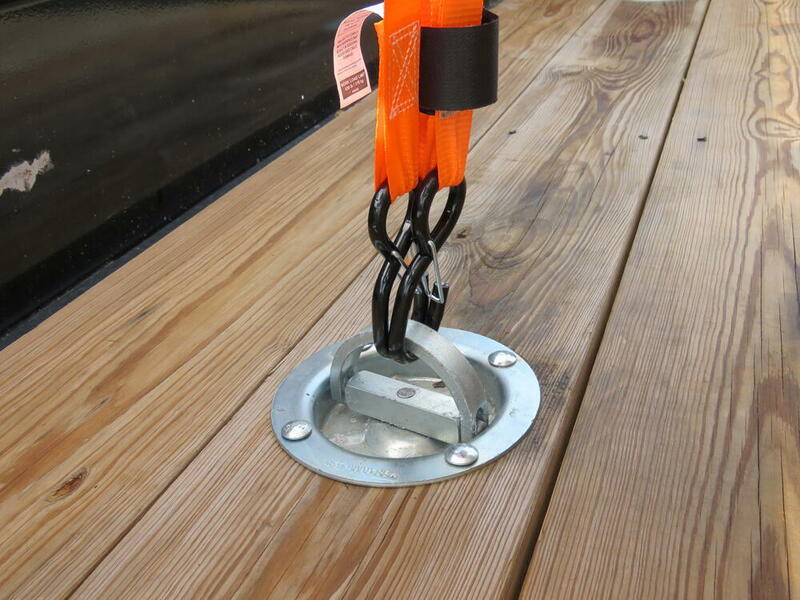 Now, these tie-downs simply let you secure cargo in your truck bed or trailer. Ratchet straps or tie-down straps are always great to have on hand and these are a really great option to consider. They're really nice quality. We're looking at a safe working load limit of 830 pounds per strap. That's a maximum load or break strength of 2,500 pounds per strap. 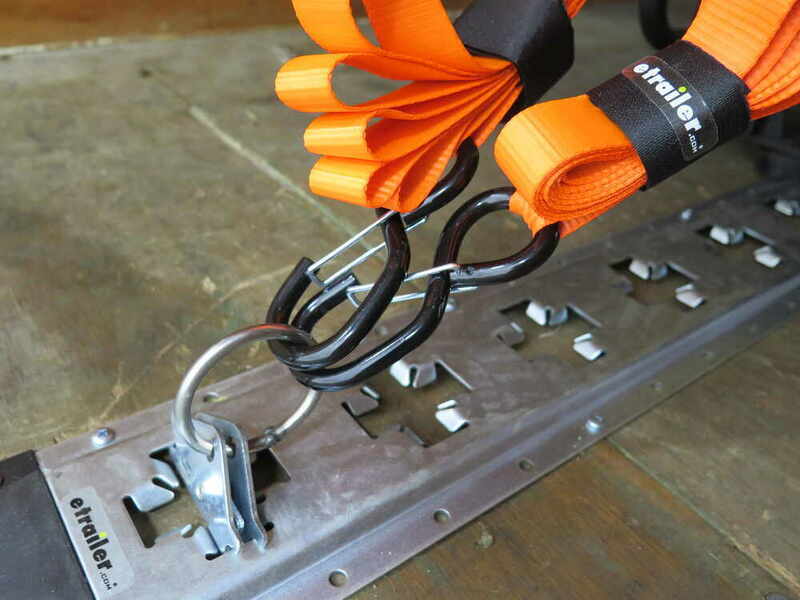 Now, these ratchet mechanisms make it easy to tighten down and maintain tension on the straps. So we have the really nice, extra-wide handles. They're easy to operate with one hand and are easy to operate even if you have a pair of gloves on.They have the finger indention, quick release buttons right here. That's what you would press when you're ready to open up the ratcheting mechanism and loosen the tension that's applied to the strap. So you could open up that all the way, pull on the strap with the hook and that's going to pull out any excess. That's how you would loosen up the tension. Then when you're ready to tighten down the strap over or around your cargo, press the release button, move it to a center position. This is your ratchet in position. Very nice ratcheting motion. I don't feel any kinking or binding. And then in the all-the-way down position is that locked or, what I like to call, travel-ready position.Now, on the ends we have the S-hooks. 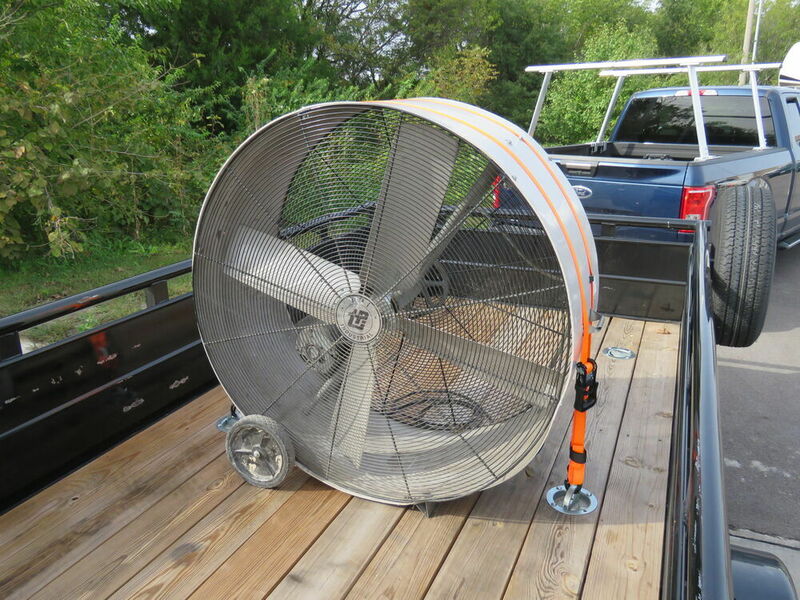 They feature wire keepers which help keep the hooks from accidentally disconnecting so that way if you're on one side of your truck bed or trailer you can hook it into position and you don't have to worry about there being too much slack in the strap and then coming off. 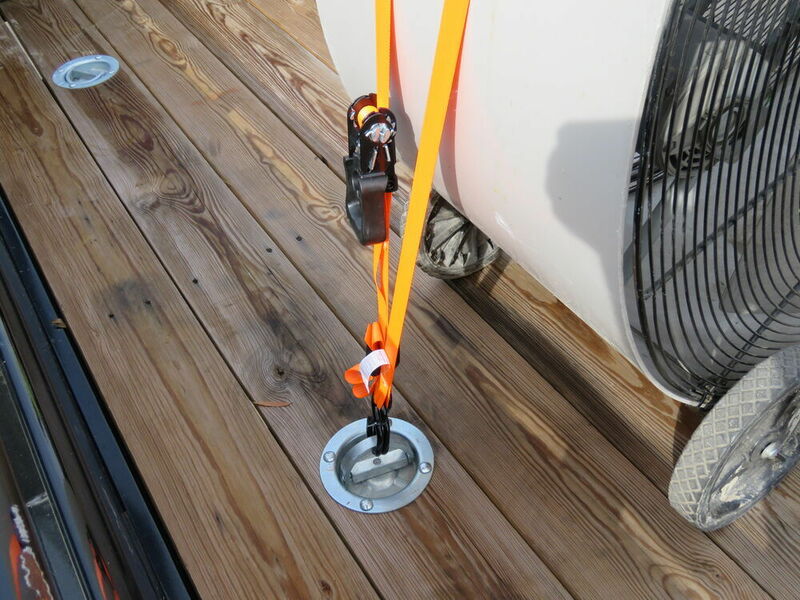 The wire keeper keeps it connected to your anchor point so that makes it easier for one person to set the unit up and to get ready to tighten down your load. We also have a hook and loop fastener right here. 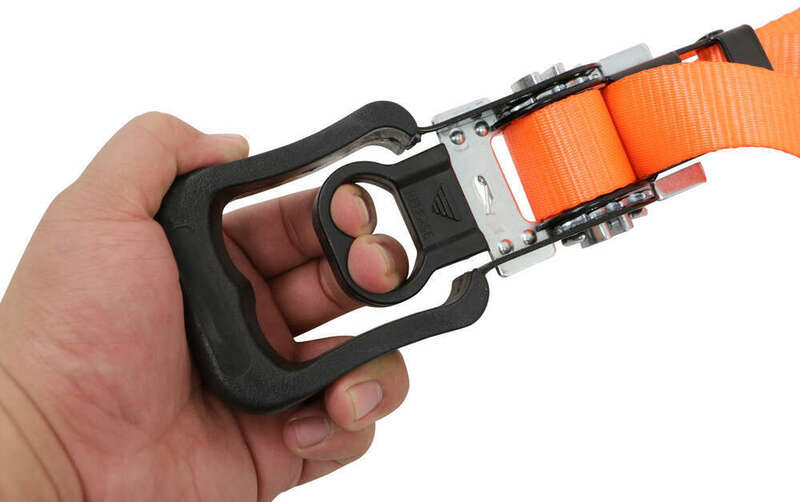 This is designed to hold any excess webbing tightly in place. That way it's not flapping as you go down the road. And then also as you can see, we can also use it to make our straps a little bit more organized for when we're ready to store them away in the bag.The hooks are made from steel. They do have a nice coating on them so they won't scratch or damage anything they come into contact with. We're also looking at a polyethylene webbing with really nice stitching. It's very durable and resistant to impacts and abrasions. The storage bag is a durable nylon storage bag. It lets you keep the tie-down straps together when they're not in use. It has a no-hassle zipper closure as well as a reinforced handle for easy transportation. Now, when it comes to the dimensions of the strap, we're looking at 12 feet long per strap by an inch and a quarter wide. Again, the safe working load limit 830 pounds. Maximum load or break strength is 2,500 pounds and with this part number you get a total of four units so that's four ratchet straps.Just always keep in mind that tie-down straps must be chosen according to their safe working load limit so the weight of your secured cargo must not exceed the combined working load limit of the straps being used. So when they're not in use you can simply take them, put them inside your storage bag, move them to a storage compartment, put them in your garage, under your rear seat in your vehicle, wherever you need to until you're ready to use them again. That's going to do it for today's look at the etrailer ratchet tie-down kit. 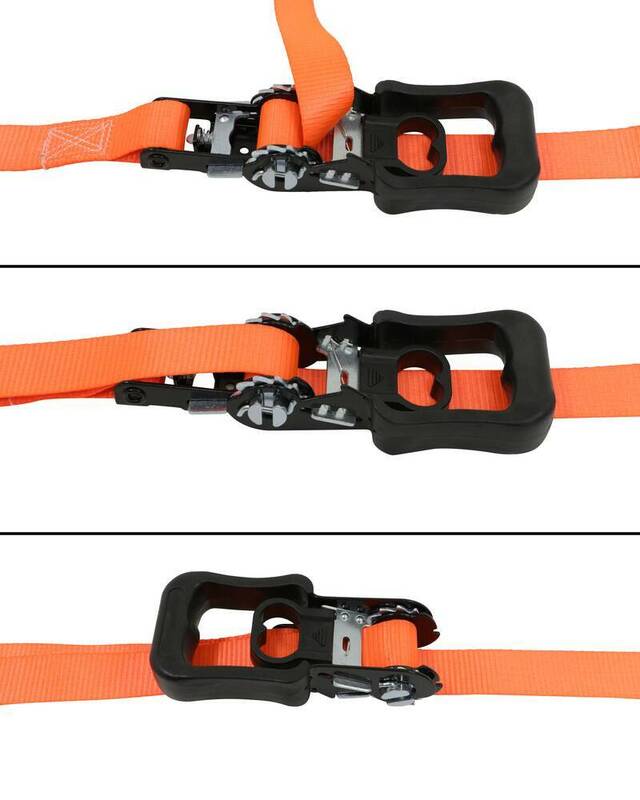 Order: RelevanceNewestRating - High to LowRating - Low to High Securing your cargo is easy with these ratcheting tie-down straps. S-hooks with wire keepers make it simple for 1 person to secure each strap in place. A durable storage bag is included for when the straps aren't in use. 2,500 lbs Max load. Yes, the Ratchet Tie Down Straps w/ Storage Bag # ETBMB-05852 that you referenced do come assembled. Check out the review video I attached for more info as well. Yes, the hooks of the Ratchet Tie Down Straps # ETBMB-05852 that you referenced will easily fit the rails of the 24x60 Reese Cargo Carrier # 63153. These straps would do a great job securing cargo on this carrier. 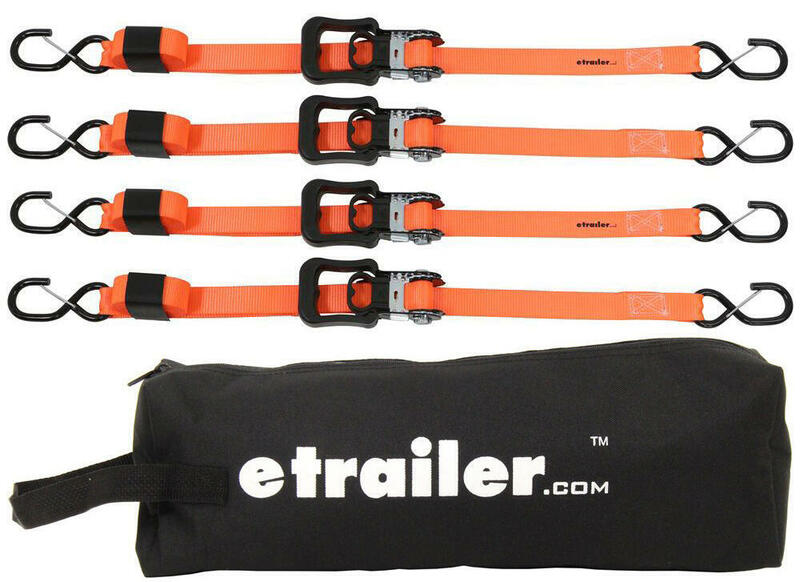 This is a set of 4 ratchet straps with each having a safe working load limit of 830 lbs.